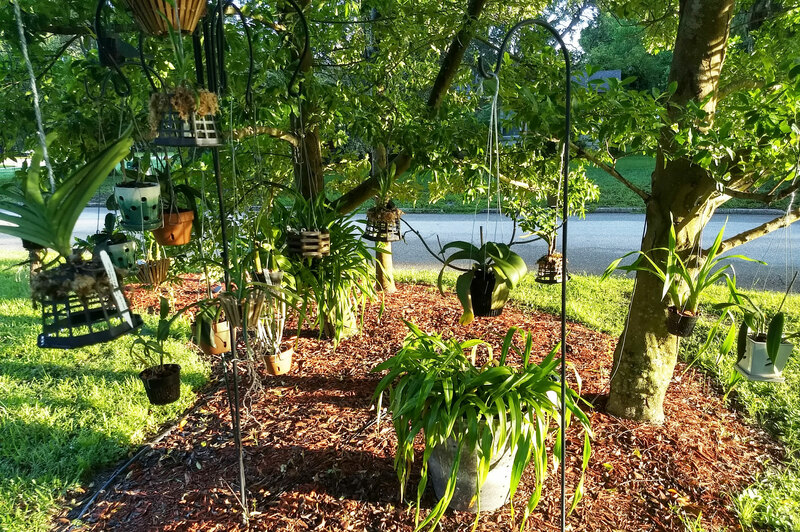 Need help balancing sun & water in outdoor orchid orchard - Orchid Board - Most Complete Orchid Forum on the web ! Question #1. I'm in zone 9B (West Central Florida). I have thirty or so orchids living in a cluster of trees outside (only option). No one gets full scorching mid-day sun but everyone gets some level of direct dappled light. Some get it during prime time but most get it when the sun is low in the sky early or late in the day. If it's windy, everything is fubar.v shot below was 7:30 am. My current victims are mostly phals, vanda's, dendrobiums, oncidiums, a few cats, plus a paph, a miltassa, a zigonesia, 1 brassidium, 1 maxillaria tenluifolia, a zingo, a cynoches, a vanilla planifora & a few mysteries. As a true beginner, don't know what they need. I have no idea who needs what kind of light, or how to manage them in this location. Or better said, no idea about anything. Can you help? Question #2: We get monsoon-level rains periodically. They go on for weeks. I just repotted all of them into slotted, mesh hydro or slat baskets. I used a bark mix & threw as many semi-hydro sees in as I could afford to buy. But I'm still freaking because currently they're getting flooded almost daily, sometimes several times a day. Again, keeping them outdoors in an environment that I can't control is my only option. Please advise how can I deal with these conundrums? Thanks bazillions! Mount the catts, dens and oncidiums. The vandas should be bare root in a basket, or with spanish moss hanging off the roots, so they will be fine. As for the others, I have no idea. Last edited by plantzzzzz; 08-31-2018 at 11:13 AM..
As long as they drain well, the water should be OK, especially since it is warm... after all, that's what they get in nature. You do need to think ahead to winter, though. The Cycnoches needs to be completely dry in winter (but also doesn't need much light or any other care...) Bring it into the house once night temperatures are below about 55 deg F (12-13 deg C), and start watering when the new growth and new roots are 3-4 inches (7-9 cm), not before. Phals, maybe the Vandas, and some of the others may also need to come in for the winter (9b implies some significant frost) Need to take a good look at what you have, to decide how much winter pampering they will need. Many orchids can tolerate more cold than they would prefer if kept dry. I thought I was in 9B. I'm just north of Sarasota & run the a/c at Christmas. Haven't seen frost in decades. Never thought about temperature unless we have the rare freeze warning. Florida weather is beyond fickle. I've been fretting water & light. I had no idea orchids were that complicated. I think I need a mentor & someone to move a couple of 50-pound oncidiums. Thank you so much for the advice and reassurance. My small collection was so enjoyable that my family gave me an orchid birthday. I don't know what most of what I got is and worst, I didn't know anything about what I started with. All I know is that people stop their cars to look when all the Phals pop at once. They're hung in a waterfall arrangement and they all go at once with 4-5 spikes. To I thought all orchids were that easy. Not. Where do I start to learn? I can’t help much with the orchids but I can say you must have very honest people in your neighbourhood. The first step you've taken already: Join the OB. Next...keep doing what you're doing and, when in doubt, ask here. Meteo data at my city here. Do some reading, and get to understand what each of your plants needs. Orchids are "niche plants" with very specific cultural requirements, and your collection is varied enough that you will not be successful treating them all the same.